In 2017, Chef Tatsuya and Chef Yoshi set out to create an inviting space where traditional kappo cuisine could be enjoyed by everyone. A place where their passion for creatively-crafted seasonal dishes could be enjoyed by the community in which they lived. The name STEM comes from their motto, “We are the stem. You are the flower.” An idea that mirrors the journey their food takes to reach the table. With their trusted suppliers and artisans at the root, the chef’s cultivating of the stem, and finally, the supporters and patrons who help each seed planted, blossom and bloom. 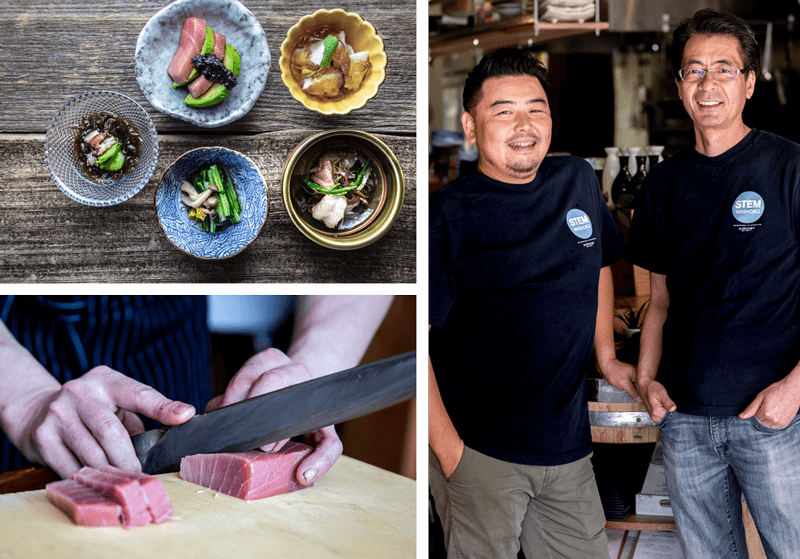 Having both worked at Zest (now Yuwa) together, both Chef Tatsuya and Chef Yoshi have a shared passion for detail. Their impressive assortment of dishware at STEM is a collection from their personal travels to Japan. Their extensive wine and sake list are favourites that have been specifically selected to accompany the menu. Kappo ryori or Kappo cuisine, is the Japanese culinary art of cutting and cooking. It incorporates seasonal ingredients with a variety of traditional Japanese cooking techniques. Though kappo cuisine is often known as an upscale type of Japanese cuisine, STEM adds a modern twist, making it both accessible and approachable.